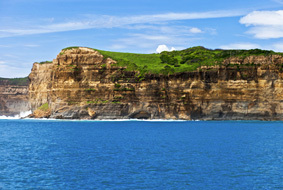 Serangan Harbour is ideally placed, just 20 minutes or a little more away from most southern Bali tourist areas including Kuta, Legian, Seminayek, Jimbaran and Nusa Dua. 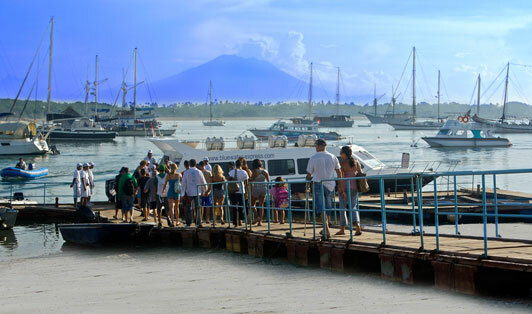 The great news is that most trips from Serangan involve a hotel pick-up by the ferry/fast boat company, offering great customer service, air conditioned transfers in new minivans. That really takes the hassle out of your trip because the departure point itself is in a slightly hard to find area. Facilities at the pier are really good, with a comfortable, airy, covered restaurant and nice food options. You'll be comfortable whilst waiting for your trip. Whether leaving or arriving, the friendly fast boat operating staff are really helpful. They'll take care of your luggage from bus to boat and vice versa. The custom made piers are very customer friendly, making the boarding process a simple one. Enjoy your trip!